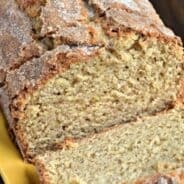 I attempted again this week to make bread. If you recall, I had a slight mishap in the kitchen when I went to make this chocolate bread. But, I’ve made this recipe before so I was pretty sure I’d be okay. Plus, I actually prepped my loaf pans before I made the batter. Something I rarely do. If ever. I’m lazy like that. And, to my delight, the bread turned out perfect. Just perfect. 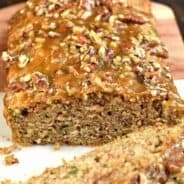 I know many of you already have a banana bread recipe you love. Something tried and true, probably from grandma. I did too. 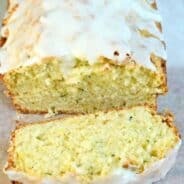 Until I stumbled on this recipe. Now I’m in love. And, as most good bread recipes should be, it makes two loaves. I love to freeze the other loaf for a future breakfast. Usually we take that second loaf straight from the freezer and pack it in for camping. Which is exactly what I am doing this time too. I may even be eating this at camp while you are reading this post! Ha! Oh, and it’s healthy. It’s got oats, whole wheat flour and bananas. So feel good about it. Plus, I heard chocolate is now good for you. Right? Preheat oven to 350 degrees. Line 2 bread pans with parchment paper on the bottom, brush with canola oil. In large bowl, mix together flours, oats, sugars, baking powder and soda, salt, and cinnamon. Add in milks, eggs, butter, vanilla and banana. Stir until combined and fold in chocolate chips. Pour batter into prepared pans, bake for 50 minutes. Your bread looks so good to me right now! 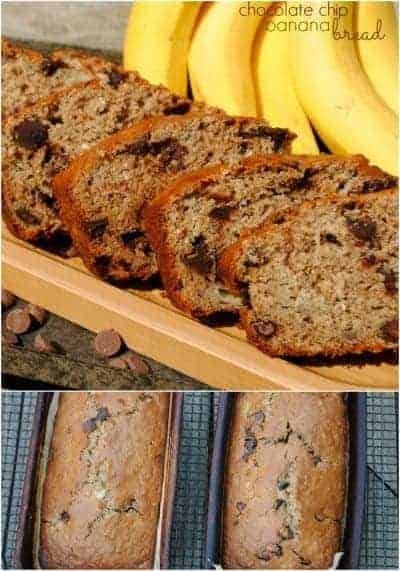 I’m glad you highlighted the fact that it’s healthier with the whole wheat flour and oats, so now I definitely want to try this out! I have a healthier version of blueberry muffins, but these with the chocolate chips look, look outstanding! I’ve only recently discovered the beauty of bananas and chocolate together. I didn’t know what I was missing. I know that I would love this bread. Thanks for sharing on A Well-Seasoned Life’s Sweet Indulgences Sunday. Yum. I don’t even know what recipe to try first, there’s so many yummy looking things to try! This looks like my kind of breakfast. It’s always a good idea to start the day off with something sweet. Oh yum! 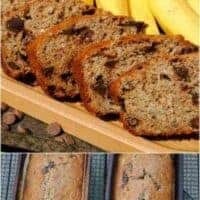 I always love finding some new banana bread recipes! Ok, so I wanted to make a banana bread, with over ripe bananas I had here. I didn’t want the usual recipe that calls for oil, so I came to your blog and was so excited to find this recipe. I love that you use these ingredients in it and my daughter loved helping make it too. I changed it up a little since I didn’t have heavy cream, just low fat cream, and it had a bag of peanut butter and chocolate chips I used instead of just chocolate, I will let you know how it turns out…oh and I only have one loaf pan, so made cupcakes instead. I made this only I didn’t have wheat flour so just used white and I used evaporated milk instead of heavy cream. It turned out super yummy and really moist. I will definitely make this again. Thank you for the recipe. Your welcome. Getting ready to try some more of your recipes. I got “duck dynasty” cups as a gift for someone for Christmas and am going to fill a couple with the Christmassy Puppy Chow. Of course, I’ll have to test it to make sure it tastes good. LOL – I’ll let you know what I think of it when I’m done. I have some old almond bark though and afraid to use it so have to get some new first.